Shade, privacy, and beauty made easy. 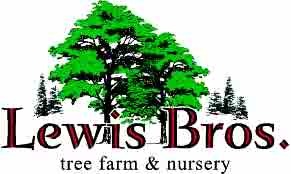 Get the healthy, vital shade trees you’re searching for at Lewis Brothers Tree Farm & Nursery. Looking for something different? Try one of our other shade tree varieties! Whether it’s a honeylocust, hackberry, or elm, we’re here for you. Our locally grown shade varieties are selected for their ability to thrive in our area’s climate. Whether you need a single tree for your yard or need to create an extensive windbreak, our experienced professionals are here to help. Let us help you design your planting with a free home consultation and design software. Just give us a call orcontact us. Information is ready and waiting for your request. Make a nursery appoint to view your options today! Autumn Gold’ is an all-male cultivar typically growing at maturity to 40-50′ with a symmetrical, broadly spreading habit. Although the fan-shaped, medium green leaves are attractive in spring and summer, it is the fall foliage that gives this cultivar its name. Bright golden autumn leaves are spectacular. Excellent choice for a variety of uses, including lawn tree, street tree or shade tree. It easily grows to 80 feet tall by 60 feet wide when found growing in the open, often with a single trunk that quickly branches into several spreading huge branches that form an ascending or spreading canopy. As a member of the Elm Family, it is related to the Elms and other Hackberries. In youth weakly pyramidal; in old age the crown is a broad top of ascending arching branches. The Heritage Birch has a narrow, pyramidal to oval crown habit. When young, it has many fine branches that, with age, become more oval spreading wider as several branches become dominant. It’s bark is scaly beige or creamy white, which remains an attractive pinkish-white for a period. Considered a superior selection of River Birch because of it’s dark green foliage. Strong in damp or wet soil. Accolade Elm is a cross of Japanese and Chinese species selected their vase shape, vigorous growth, excellent drought tolerance and good strong yellow fall color. Exceedingly glossy dark green leaves in the summer, it has excellent disease resistance to both Elm Yellows and to the dreaded Dutch Elm Disease. Wild and open as a young tree, requires pruning to develop an attractive canopy. 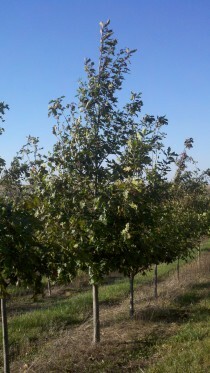 The Discovery Elm is an extremely hardy tree being one of the most stress and drought tolerant of the hybrid elms. Growing medium in size , distinctly upright, more compact, oval to vase-like habit, forming an arching vase-shaped canopy. Dutch Elm disease resistant. Leaves are 1 1/2″ – 4″ long and 1″ – 2″ wide. The Frontier hybrid elm combines a high level of tolerance to Dutch elm disease, small leaves, and a lovely red-purple autumn coloration. It is perfect for use in smaller landscapes, along city streets, and under power lines. ‘Frontier’ blazes a trail for elms in the urban landscape. Leaves are dark green changing to yellowish and redish purple in fall. This tree has a faster growth rate than other littleleaf Lindens with a more open, canopy forming a moderately dense pyramidal to oval crown which casts moderate shade. The Greenspire Linden, part of the Littleleaf Linden family is a result of a cross between cultivar ‘Euclid’ and a selection from the Boston Parks. It maintains a single leader with a nice branching habit. Soil Conditions: Adapts to a variety of types.